Dusky, rainy Hong Kong turns on its lights. 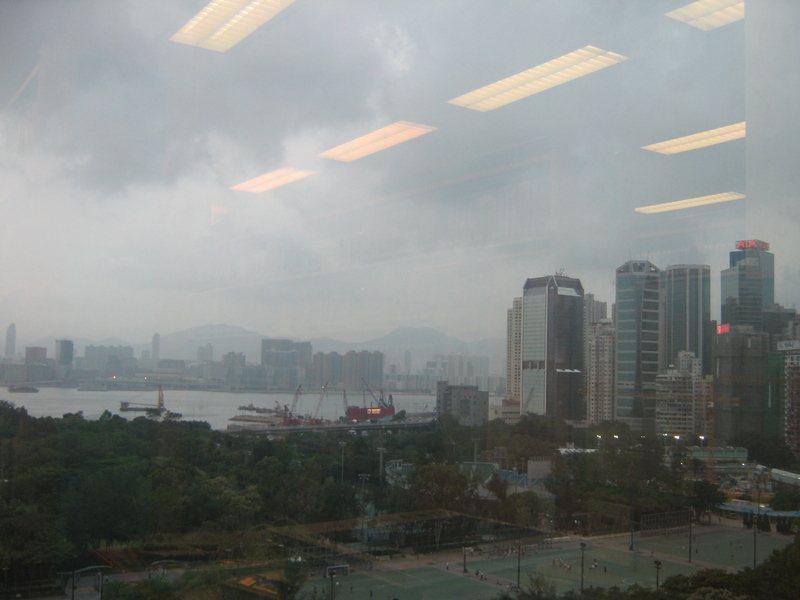 Taken from a desk at the Hong Kong Public Library-- 1 of the 4 libraries I scoured in 3 days. Who says being a geek isn't fun?!? So arguably, the beginning of Thomas Liao’s entire career in politics in Asia can be traced back to the influence of his older brother, Joshua, who lived in Hong Kong until his death in 1952. You could say, maybe, that Joshua’s death led to Thomas picking up the torch of the independence movement and carrying it. But Joshua’s abrupt departure from any and all accounts of the independence movement perplexed me: what was his role before he died? Did he theorize politically in the background, while Thomas gave the speeches? Or would he have led the movement, and later, the “Republic of Taiwan in Exile” in Tokyo, had he lived? His children and wife later went to America, I believe, Hawaii. They have not been in close touch with the rest of the Liao family, nor us with them, either in America or in Taiwan. But I went to Hong Kong, dying to know: what happened to Joshua? How did the Independence Movement begin? What was his role? How did he influence Thomas, and other prominent independence fighters like Liao Shi-hao (Suho), Huang Ji-Nan, and those who became the cabinet of the “Republic of Taiwan” in Japan in the late 1950s? I didn’t find personal records, materials, or primary source archives. This, I suppose, is my public appeal: if you know or have anything from Joshua (Wen-Kwei) Liao’s life, I’d love to see it! I don’t have to blog about it! Please contact me! But here is what I did find: his writings, his publications, and his letters to George Kerr. In his dissertation in philosophy from the University of Chicago, “The Individual and the Community,” which would later be published as a book by Routledge (and re-issued in the last few years), Joshua builds his argument about the role of the state in the lives of the people, and role of an individual in reforming and evolving the state. His pet example is Sun Yat-Sen, who he uses to draw a distinction between “Imperialism vs. Nationalism.” He would later use that same distinction in an article of that title, published merely a month before the 228 Incident, that now has a chilling predictive tone to it. I also found Joshua’s main work on Taiwan Independence, “Formosa Speaks,” which is a recounting of the petition made to the United Nations on behalf of Formosans who wanted self-rule in 1950, after the 288 Incident and Chen-Yi’s disastrous tenure in Taiwan. “Tommy is now in Japan. He sailed on Feb. 4. Before his departure both he and I had the opportunity to see Dr. Jessup. As Dr. Jessup had already seen our comrades in Japan as well as in Formosa, there was no need for us to speak to him in any detail. In particular I stressed the value and need of ideas in peacetime as contrasted with weapons all governments of different countries have been developing and manufacturing. Regarding the Formosa Problem, still ideas should be preferred to weapons for its solution. There’s no reason why it could not be solved to the satisfaction of all parties concerned– not only the Formosans and the Chinese, but also the surrounding democratic peoples like the Filipinos, the Koreans, the Americans, the Englishmen, and the Japs who intend to become ‘democratic.’ ‘For the spiritual liberty of our people and for the material prosperity of our country we’re determined to fight even longer than the Irish did,’ I added. ‘But I hope we won’t have to struggle so long as the Irishmen did,’ I concluded. Dr. Jessup smiled. So did his secretary and Dr. Schultheis. Happy that your research is going well and I hope you continue to find out more. Woot, woot, go Routledge! (Now they should re-issue the rest of Joshua Liao’s oeuvre, ha. Can you do anything about that??) Thanks for the kind words; wish you were here to library hop and geek out on old books with. Have you ever done a post on outfits to wear TO the library? Library chic? !